Accra, Ghana — Zimbabwe's presidential race tightened between early May and early July as incumbent Emmerson Mnangagwa's lead over challenger Nelson Chamisa dropped from 11 to just 3 percentage points among registered likely voters, a new survey shows. Findings of the nationally representative survey, which the Mass Public Opinion Institute (MPOI) conducted in all 10 provinces of Zimbabwe between 25 June and 6 July 2018, suggest that the MDC-T Chamisa/Alliance has benefited from a small increase in party identification and perceptions of Chamisa as the more capable candidate to address voters' top priority: job creation. Compared to a pre-election baseline survey in April/May, the new findings point toward a close election outcome denying the winner a broad electoral mandate, and confirm majority support for a Government of National Unity (GNU). - The survey confirmed high levels of self-reported voter registration (88%, up from 85% in early May) and of likely voters (88% of eligible voters said they will "definitely" or "probably" vote, unchanged from early May). 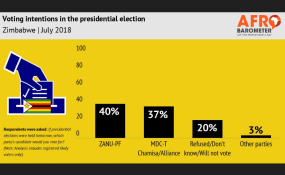 - While the proportion of Zimbabweans who said they feel close to a political party grew slightly between May and July, from 65% to 68%, the ZANU-PF's advantage in terms of party identification declined by half, to 5 percentage points: 34% of respondents said they feel close to the ruling party, while 29% identified with the MDC-T party and Alliance. - Chamisa outranked Mnangagwa, 42% to 32%, in popular perceptions of which candidate would "do a better job in creating jobs for the people" - by far Zimbabweans' most important campaign issue. - As for who was ahead in the presidential race, Mnangagwa's 11-percentage-point lead in early May (42% vs. 31% for Chamisa) dropped to just 3 points as of early July: 40% of registered likely voters said they would vote for the incumbent vs. 37% for the challenger. It is important to remember that an uncertainty factor of +/-2 percentage points surrounds these figures and that the voting intentions of 20% of registered likely voters remained unknown. - When asked which candidate they think will win the election, 43% of all respondents picked Mnangagwa, while 34% said Chamisa. - Six in 10 Zimbabweans said that if no presidential candidate achieves a clear victory, they would favour the creation of a Government of National Unity (GNU). The proportion who thought that a GNU was likely increased from 33% in early May to 41% in early July. The Institute for Justice and Reconciliation, Afrobarometer's core partner for Southern Africa, commissioned two pre-election surveys in Zimbabwe. Fieldwork was conducted by the Mass Public Opinion Institute (MPOI), Afrobarometer's national partner in Zimbabwe. Technical support was provided by Afrobarometer, a pan-African, non-partisan research network that conducts public attitude surveys on democracy, governance, economic conditions, and related issues in African countries. Afrobarometer conducts face-to-face interviews in the language of the respondent's choice with nationally representative samples. Findings from the first survey, conducted 28 April-13 May 2018, are available at www.afrobarometer.org. For the second survey, MPOI interviewed 2,400 adult citizens between 25 June and 6 July 2018. A sample of this size yields country-level results with a margin of error of +/-2 percentage points at a 95% confidence level. For more details, see www.afrobarometer.org. Copyright © 2018 Afrobarometer. All rights reserved. Distributed by AllAfrica Global Media (allAfrica.com). To contact the copyright holder directly for corrections — or for permission to republish or make other authorized use of this material, click here.